"Ahh, I do like her, if not, why would I be going out with her?" This.........perhaps this would be a 'like' then. "Really? Which part about that person does gege like, then?" "Which part that I liked, huh.........probably her gentle personality.........."
"No, not only her gentle personality. I just like her, I'm attracted to every single part of her, if it's to be clearly explained, I really can't say it out properly, ehehe." "Then.........does Ji Lian Bing like gege as well?" "Yeah! Isn't she a wealthy dàxiaojie from a plutocratic family? Why would such an aristocratic dàxiaojie be falling in love with gege? Have gege never suspected about that before? Perhaps she has other intentions by wanting to get close to gege.........."
"Even if you're to say something like that, there's completely nothing to be gained from scheming against me. Or it should be said, that it's precisely because she's a rich dàxiaojie, which is why she appeared to be very sincere when she chose me, isn't it?" "Then, gege really likes Ji Lian Bing, heeh?" "Ahh, just like what I've said." "..........Compared to Ke Ling, gege still liked her even more?" "Why must this be compared, I like the both of you just the same." "No! It must be said clearly! Even if gege really likes both, there definitely will be a person that gege likes even more!" "A person's most favorite thing can only be one.........only be one!" "So, where to next? I remembered that gege said that he wants to select a birthday present for his girlfriend, right." "Well, that's the plan indeed.........."
"Heeh, going to select a present for that Ji Lian Bing, huh? That sort of dàxiaojie doesn't seem to be lacking anything at all~"
"Err, mn........that's why, I'm hoping that you two will be able to give me some suggestions........."
"Is it~ I think that it's better for gege to choose it instead, since it'll be more sincere that way, isn't it? Humph!" "Y-, you have a point, ahahaha.........."
"Well, it's better for me to choose.........."
"Sorry, gege, it's Ke Ling who is too spoilt already.........gege, please don't hate Ke Ling, alright? Ke Ling upon seeing gege treating his girlfriend so importantly, can't help but become jealous.........."
"It's fine! You also have a point too, Ke Ling! It's indeed true that it'll be more sincere when I'm choosing one myself! I'm not blaming you, okay?" "Heehee, I love gege the most already~"
"Mm? This isn't the place for a brat like you to be here, get out." "Oi oi, what are you doing? Didn't I ask you to get out already!" 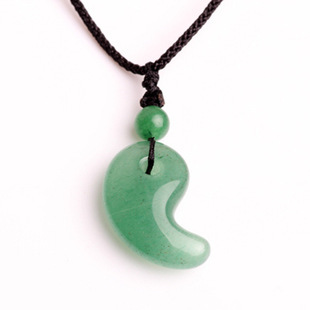 Shaped like the letter 'C' of the English alphabet, with a tiny hole being dug on top, a magatama*. "..........Oho, so this brat is also a 'customer'." "You saw my shop's name before you came in right? Wanting to buy stuff from my shop here depends on fate itself, and you, seemed to have fate with 'that'." "Since there's fate therein, I'll just accept a friendly offer then. 699, how about it?" "How about it? Are you buying it or not! If not then get out!" "I'm buying! Of course I'm buying!" "Fine, then I'll wrap it for you." "And as such, the magatama is now handed over to his hands.........."
"Is it really fine like this? Didn't he say that he'll go give it to someone else?" "It's fine, if it's to be given to that person, it'll still be the same." "Uhh huh.........I don't really get it, but anyway, the matter that you asked me to do is considered to be finished, right?" "Mm, it's done, thank you. Here's the reward that you wanted, a ghost exorcising talisman." "It's a small matter. But, Yu Hui, to be giving such a precious item over to that little boy, is it really alright? Plus, he's using it to give to someone else too.........really, I don't even know what to begin saying already. It's been quite a while since I've opened shop here, and I've seen quite a couple of 'authentic goods' as well, but that magatama that you wanted me to pass over to him is..........sigh, a pity." "That.........originally was something which belonged to him." "Returning it to its original owner, huh.........."
"Mm, returning it to its original owner." "Oho.........I've even acted intentionally just now, thinking of simply frightening him off as well, but I didn't expect that he'll immediately take a liking to that magatama the moment he came in. Even though I've intentionally mixed that magatama amongst a pile of beautiful stuff, he still managed to seek it out with just a single glance..........such things as fate, it's indeed truly unexplainable.........."
"..........If it's fated, treasure it even more so." "I don't get it.........perhaps I still won't understand that even up till my death.........."
"Then just, continue with your past fates during the next cycle of reincarnation." Well... I want to know what exactly does anyone from him. He's a MC material even from his past lives, according to his childhood friend. And now someone made it so he was surrounded by the abnormality with no one noticing, until he gained that special ability. Oh, I forgot to add this, it seems that something happened in the past, thus the reason why part of his hair is white. Maybe something related to his biological mother? I've been rereading since yesterday. His hair is largely a normal color but there are strands of white mixed in. It's not like a white streak but kind of like if you had started greying. "Can't it be the third option instead?" yeah, I do not capitalize the "dangerous" intentionally, since this chapter is kinda "lowkey"
Thx for the chapter.. Flare sama how many chapters again before vol 2 end? and does we can see adv stalker in action in the another chapters of vol 2? woa woa, ghoul girl is the loli girl that meet him from previous live in hell right ???? Ghoul Girl is probably the Principal's friend Xiang Yue Xun. While Zombie Girl is probably Li Nai. I have troubles remembering, but are you talking about the ghoul ? Thanks for the chapter flarewk! Looks like his past is shady too. Buying a present huh, almost time for the birthday which is when the mc will start getting chased for his fingernails by the loli. Hum... Well, not many chapters left now.